The day of the Parsons-Clover burn began with a briefing. The participants of the Ashland TREX, sat around three tables in the basement of Cox Hall, the dorm they were staying in at Southern Oregon University in Ashland, Oregon, waiting for updates from meteorologists, safety reminders and their assigned burn locations for the day. The fire crews, who were divided into three modules: Alpha, Bravo and Charlie for the TREX, represent various fire departments and land management agencies from 11 states and 20 organizations including the U.S. Forest Service, The Nature Conservancy, Ashland and Medford Fire and Rescue, the Bureau of Land Management (BLM) and tribal fire management crews. Module Bravo was assigned the Parsons-Clover burn. “Bravo, you guys are going on a wine-tasting tour today,” joked the man reading location assignments. That day, the deputy incident commander at the Ashland TREX was Katie Sauerbrey. In this role, she is responsible for overseeing all three burn modules and making sure their various needs are met, but she said she’s happiest when she’s a burn boss and is responsible for the actual burn process. 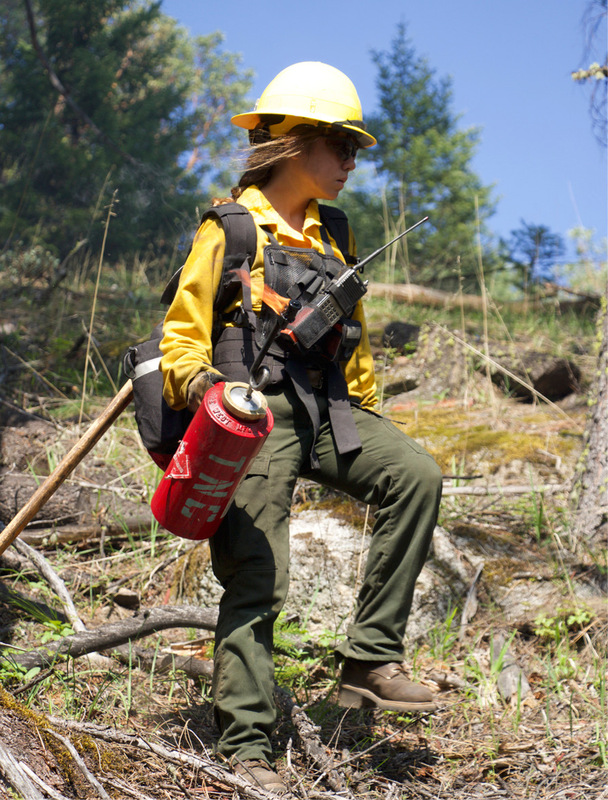 Sauerbrey, whose father was a fire-suppression firefighter, is the land steward of the Sycan Marsh – 31,000 acres of land in South-Central Oregon near La Pine – and, as the Deputy Incident Commander, is second-in-command for the whole two-week burn training. “There’s a million reasons to burn,” she said. But, there was the unexpected call from the burn boss that day; the call for the Parsons and Clover’s meadow burn to be postponed. There was a lack of clarity between the burn crew and the Oregon Department of Forestry (ODF) Smoke Management department. ODF didn’t know about the fire and the crew was not cleared to put smoke into the air for the day. The Parsons-Clover burn resumed the next day with clearance from ODF Smoke Management. 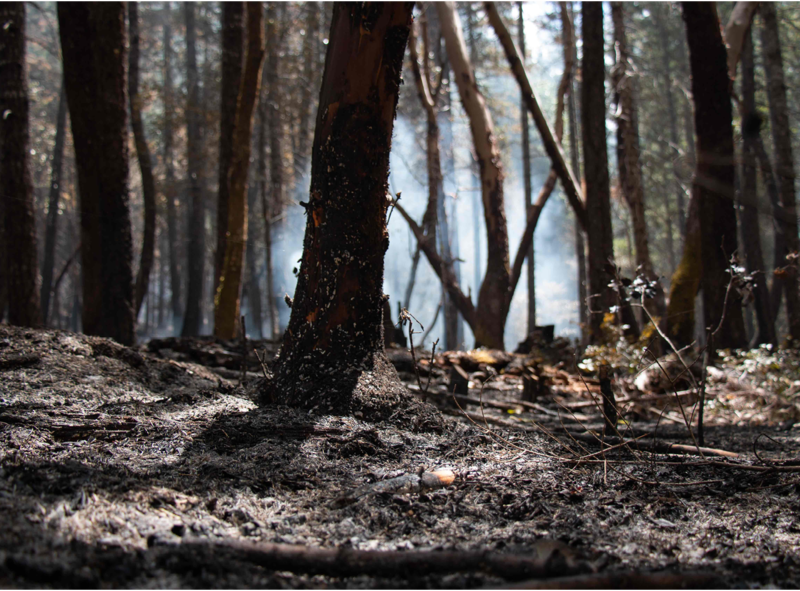 Smoke sensitive areas, including the Applegate Valley – where summer wildfires dump thick, dense smoke into communities – are now doubly exposed to smoke because of prescribed burns. However, for these communities, small amounts of less intense smoke in the spring produced by prescribed burns may be a surprising remedy. Firefighter Type 2 Karen Teeter uses a drip torch of diesel and gas to ignite fire lines at the Parsons-Clover residence. A section of Bureau of Land Management land in Medford, Oregon smolders the day after Prescribed Fire Training Exchange crews lit a prescribed burn. Western science, fire ecologists and landowners are playing a game of catch-up, needing to undo a century of devastating fire suppression. George McKinley, who drives a 1977 maroon Bronco, and his wife Maria Kelly own 600 acres of land in the Green Springs Mountain area, which is east of Ashland in the Cascade-Siskiyou National Monument. The Green Springs Mountain sits in the convergence of the high desert of Eastern Oregon, the Cascade-Siskiyou and the Klamath National Forest, and has historically been a place of forest clear-cutting and tree plantations. McKinley is the grandson of Christmas tree farmers from Michigan and grew up in the Midwest around trees. He has been working with the Southern Oregon Forest Restoration Collaborative since it started in 2005 and has been the executive director since 2010, working to maintain healthy forests, sometimes through fuel reduction via burn piles or controlled burns. McKinley and Kelly, who live in a house McKinley built, have been active managers of their land for many years. About a decade ago, McKinley and a group of forestry students from Oregon State University conducted a small underbrush burn without a fire crew. The couple participated in the Ashland prescribed fire training exchange (TREX) in 2016, the same program that partnered with Parsons and Clover this year. They completed a 40-acre underbrush burn that restored a Ponderosa pine plantation to raise the crown heights of trees, encourage upward growth and reduce ground fuel in hopes of preventing wildfires. While McKinley has been pro-fire for a while, Kelly has been reluctant, not initially understanding how something that seems so destructive and dangerous can be restorative and life-giving. Kelly was particularly concerned about nesting animals, but after meeting the crews her concerns abated. But Kelly’s fears were not completely unfounded. The 2016 burn with Ashland TREX didn’t go entirely as planned. In one spot the fire burned too hot and killed more trees than expected, resulting in a higher forest mortality rate than planned. Fire is difficult to control. Still, Kelly and McKinley are certain that prescribed burning is necessary for their land. While private landowners, like Parsons and Clover, and prescribed fire practitioners are beginning to see the benefit of prescribed burning in the wake of a century of devastating fire suppression policy, prescribed burning is not a novel idea. Prior to colonization, indigenous people practiced traditional low-intensity fire burning for both forest management and ceremony. Upon early contact, settlers adopted these fire management strategies, but just over a century ago, they began to introduce fire suppression policies, like the “10 a.m. Rule,” which said that fires should be put out by 10 a.m. the next morning, and began to perceive all fire as malevolent and destructive. More recently, certain fire ecologists, private citizens and firefighters are returning to a model of fire maintenance that mirrors traditional indigenous land management knowledge combined with Western science. They are turning to tribes like the Karuk. The ancestral land of the Karuk tribe of Northern California is situated in the Klamath National Forest, along the Klamath River. They are a salmon tribe and salmon are a fire-dependent species, relying on up-flow habitats created by fire to spawn, said Leaf Hillman, the natural resources director for the Karuk tribe. Fire is woven into the tribe’s traditional practices and knowledge, and before fire suppression policies were introduced, Hillman said the Karuk people didn’t have a reason to be concerned about the threat of wildfire, because there was none. But with fire suppression came a suppression of tribal practices, including controlled burning and the annual World Renewal Ceremony, where the Karuk people light ceremonial fires in the mountains. “We’ve become a homeless people within our own homeland, occupying our ancestral lands,” said Hillman. For Hillman and the Karuk people, this story demonstrates the relationship between humans and the other spirit people, including fire, something that is not evil, but is necessary and potentially restorative. “All of these things are relatives, so we have a responsibility that is reciprocal in nature,” he continued. “We have a responsibility to take care of our relations,” and that includes fire.